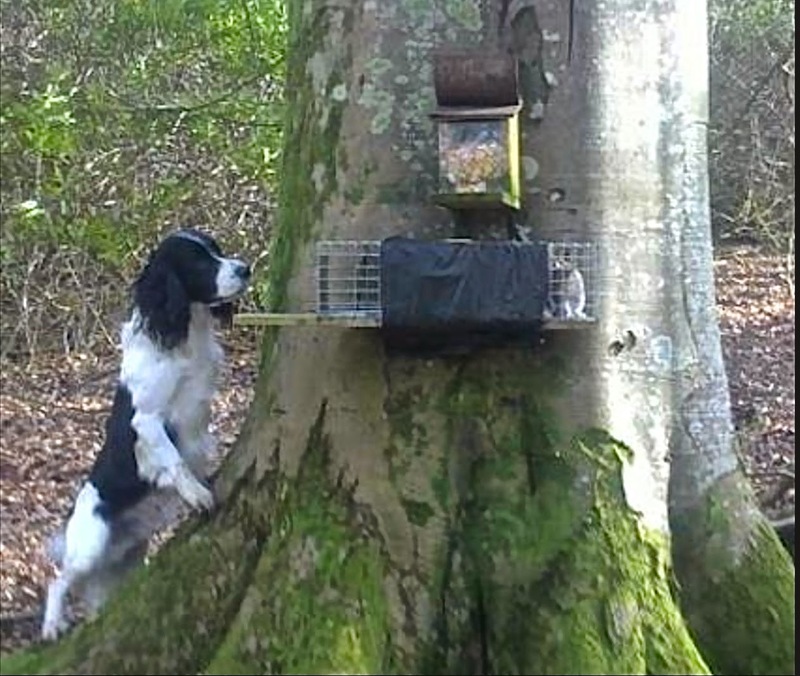 A Dumfriesshire gamekeeper’s intelligent dog has emerged as an unlikely canine hero in the drive to conserve Scotland’s native red squirrel. For years, gamekeeper Richard Thomson has been involved in controlling grey squirrels on a large estate in the south of Scotland, helping the fightback of the reds in the area. Research undertaken in Anglesey has proven that controlling grey squirrels reduces competition problems for reds whilst reducing the threat of deadly pox virus proven to kill them within a week. Records on the estate over four years have shown steady removal of abundant greys and the consequent success of red squirrel re-population in the area. However, this conservation triumph is not down to Richard alone. He also relies on the detective work of very talented and hard working nine year old black and white Springer Spaniel, Rory, who has developed a keen ‘nose’ for the job. Rory accompanies Richard on his quad bike to examine the many traps set out in the trees of the estate. He said: “I have around 100 traps spread over nearly 10,000 acres, so I have them logged onto a hand-held GPS. However, these days I never use it as Rory knows where they all are." When Richard parks the bike, Rory leaps off and runs to locate the trap, usually three or four feet off the ground, and rises up onto his hind legs to check for catch. Not only has his ability to home in on all the trap locations helped Richard, Rory has also been able to develop a clever signalling system. By listening to his bark and watching his movements, Richard knows if there is a squirrel in the box and even if it is a grey or a much rarer red. “In the beginning, Rory would come with me to check the traps and he soon learned to remember where they were and would leap off the bike and go and check them. “After a while, he would start to bark if there was a grey and we would attend to the trap. “As the success of the trapping regime grew on the estate, and the red numbers increased, we started to get some reds in the traps, too. “When this happens Rory is made to sit or get back on the bike while the Red is released. Eventually after watching this a few times he stopped barking when there was a Red in the trap. He had learned that Greys and reds smell different and reacts accordingly. contribution of volunteers on the ground, like Richard and Rory, have boosted the prospects for native red squirrels. SGA Chairman Alex Hogg said: “Gamekeepers have always controlled grey squirrel numbers to allow the reds to survive. They did it as part of their daily work in creating a balance on their ground. “Today, red squirrel conservation attracts a lot of headlines but it is good to see practical conservationists such as keepers being recognised for what is a long-standing contribution.